No one is ever going to accuse Snack Girl of not loving a WEE bit of chocolate. But, my taste bud credentials have been called into question. I will be honest, I thought this was going to be one of those crazy vegan recipes posted by someone who has not had real food in so long they find totally unacceptable food to be 5 star worthy... but I was too intrigued to not try it. I think it is AMAZING. My husband LOVES it. ETC. Yes, Jodi, you are dealing with a FOODIE here. I am not vegan and while I try to eat less meat - one of my favorite foods is bacon. Everything I write about tastes DELICIOUS to me including strange cookie dough dip with chick peas. Now, I want to you to introduce you to my new love - a dried fig, dipped in dark chocolate, with a little bit of coarse salt shaken on for a finishing touch. You know those chocolates that feature salt and caramel? This fig concoction gives them a run for their money AND you are eating a fig instead of caramel. A dried fig has good stuff like fiber, calcium, and potassium. Caramel can only say it has butter and sugar - it just can't compete! I'm not even going to mention the difference in calories between a caramel covered in chocolate and a dried fig (250 vs 50). You could eat FOUR of these scrumptious goodies for just one of the caramel chocolates. To make these pop, you need DARK chocolate. 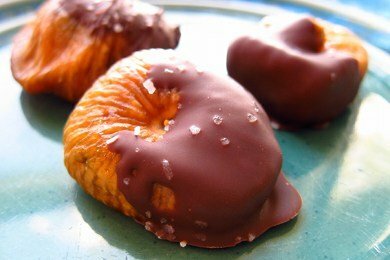 I tried them with semi-sweet and it did not work because the fig itself is so sweet. Also, you should use coarse salt and just a little. You can find Kosher salt in the supermarket for this purpose. Where do you find figs in the store? Well, I found them in the dried fruit section next to the raisins, dates, and prunes. I paid $5 for a small package - but I think it was worth it. Do you like dried figs? How do you serve them? Did you use just this type of fig or did you try it with any other? I ask because I already have some dried turkish figs, but not the above kind. I think any type of fig would work great! This is a calmyrna I think - but don't quote me on that. Great question. I love dark chocolate with sea salt! These sound yummy, will be trying ASAP! Excellent info. I have a package of figs from Sprouts and will definitely try this with some chocolate I already have that is gluten-free. I've tried the chocolate on a whim and it's not bad. This is genius. I nibble a bit of dark chocolate with sea salt each day but this one sounds so much more satisfying. Can't wait to try it. I love figs and eat them whenever I have a sweet tooth. I also eat dates stuffed with walnuts or almonds. I buy the figs at a middle eastern market for about $3 a package. I can just imagine how the dark chocolate and sea salt will enhance their flavor. I'm going to make some and take them to work for my afternoon pick-me-up. Thanks for the idea! to Qoute Cookie Monster: THEY ARE A SOMETIME FOOD! I'm sorry, you know I love all the brilliant ideas you come up with to lessen my caloric intake, but really. Caramel is caramel and a small 1 inch by 1 inch of artisan Caramel does not a fig make. Yes both are delicious and sweet treats. But that's just what they are. Treats. A sometime food. Not everyday. Not every week, just sometimes. For me Caramels I eat maybe once a year at Valentines Day when my husband goes to the chocolatier down the street and picks out a cute little box of sugar bombs for me. Not every other week, not four of five times a year, but once. That's it. that would in fact be the definition of a sometime food. Your argument is invalid. No matter what others post, I think this is a great idea!! It is less calories than the caramel. I can't wait to try it. Leslie, what argument? That figs are tasty? She didn't say, "Never eat caramel ever again," she said, "These are delicious." I applaud anyone who is willing to help those of us with less laudable will power than yours. It sounds to me like a way of dressing up chocolate covered raisins. It makes me wonder what other dried fruits would be good dipped in dark chocolate! These confections sound DELECTABLE! Fit for a Roman emperor and perfect for sharing with the emperor of your heart, like maybe for Valentine's. My mouth just watered all over my keyboard. Courtney, I bet these choco-fruit "candies" would also be delish made with dates or dried persimmons. I think I'll try this with prunes--I don't like the texture of figs because of those little seeds. Wow. So, so simple and so perfect. Made just a few for a test run and WOW! Love them! On second batch planning to add a tiny bit of coffee to the chocolate which really tends to bring out the chocolate flavor and perhaps a little twist. I haven't had figs in a really long time. This sounds fantastic. Looks like it would be great for a gathering as well. I can't wait to try making them. Yum! Wow, just tried these and I'm really impressed! Quite yummy! For dark chocolate do you mean unsweetened chocolate? Or what do you use? @Ginger - I mean at least 70% Cocoa (or more). On better chocolates you will see a percentage of cocoa - 80% would be great too. Thanks for the question!